A herniated disk refers to a problem with one of the rubbery cushions between the individual bones that stack up to make your spine. Sometimes called a slipped disk or a ruptured disk, a herniated disk occurs when some of the softer jelly pushes out through a crack in the tougher exterior. 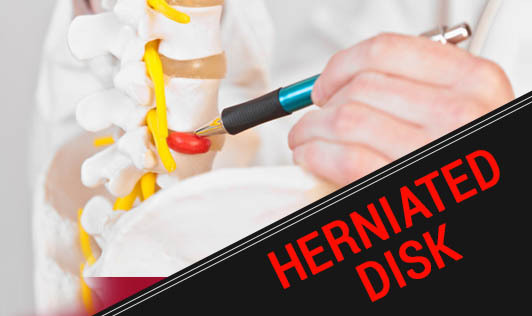 A herniated disk can irritate nearby nerves and result in pain, weakness or numbness in an arm or leg. Many people experience no symptoms from a herniated disk. Disk herniation is often the result of a gradual, aging related wear and tear called disk degeneration. As you age, the spinal disks lose some of their water content which makes them less flexible and more prone to tearing or rupturing with even a minor twist or strain. Most people can't really identify the exact cause of their herniated disk. Sometimes, if a person uses his back muscles instead of his leg and thigh muscles to lift large heavy objects, it can also lead to a herniated disk, as can twisting and turning while lifting. • The muscles served by the affected nerves tend to weaken and may cause one to stumble, or impair his or her ability to lift or hold items. • If one has a herniated disk in the lower back, he or she will feel the most intense pain in the buttocks, thigh and calf and sometimes foot. On the other hand, if the herniated disk is in the neck, the pain will be most intense in the shoulder or arm and this pain may shoot into the arm or leg when one coughs, sneezes or moves the spine into certain positions. • Exercising and strengthening the trunk muscles that will help stabilize and support the spine. • Maintaining a good posture reduces pressure on your spine and disks. • Maintaining a healthy weight.